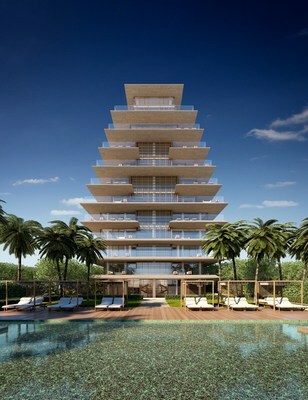 "We are excited to be the first to introduce Antonio Citterio's work here in the U.S. with Arte," said Alex Sapir, Chairman of Sapir Corp LTD, whose Israel and New York-based subsidiary, SC 8955 LLC,Â is focused on luxury real estate and is developing the project. "The level of design, finish and detail that went into the building is unprecedented in the Miami market. Antonio is very creative and thoughtful in his work, and we feel his sophisticated aesthetic will be well received by buyers and the community. Antonio Citterio, the founder of the eponymous firm, Antonio Citterio Patricia VielÂ (ACPV)â�”in collaboration with Kobi Karp Architecture & Interior Designâ�”articulated Arte's faÃ§ade with broad expanses of sliding glass doors with a gridded bronze Schuco window system and accented with Roman travertine. Expanses of the property's lush landscaping is designed byÂ Enzo Enea, one of the world's leading landscape architecture firms.